Gopal Mittal, a Maruti Suzuki dealer in Haryana’s Rohtak, was looking forward to welcoming buyers to the brand new Nexa showroom, due for inauguration on February 28. He won’t be able to. Agitating Jats put the two-floor showroom on fire last weekend, pushing back Mittal’s expansion plans. Nexa is the dealership of the country’s largest car maker, to sell premium cars -- its S-Cross and Baleno. “The showroom was damaged and then set on fire. It is completely gutted. "There was no help from the state administration and the army. About 50 of the 150 cars at our stockyard were completely burnt, while the rest were severely damaged,” said Mittal, who invested Rs 6-7 crore in setting up the Nexa outlet. As the showroom was not operational, it was not even insured. Mittal is worried about the way things will shape from here for businessmen like him. “There is huge tension. I am apprehensive where this will stop. The confidence level of the local business community is deeply shaken,” he said. Notably, the Jats, who went on a rampage to demand quota, attacked the showrooms of only non-Jats. 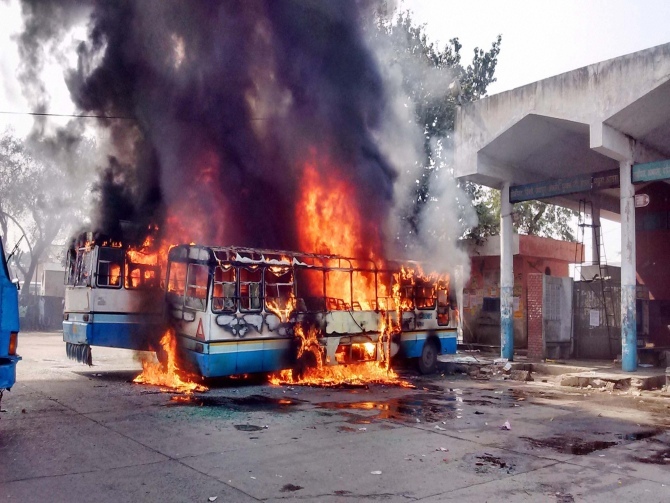 At least 10 showrooms in and around Rohtak of different automobile companies have been ransacked and torched. Many were burnt completely. Dealerships of Hyundai, Toyota, Honda, Volkswagen, Ford and other auto companies were impacted. While most are yet to estimate the extent of loss, a total of 250-300 vehicles could have been damaged. Amit Jain, a Hyundai dealer in Rohtak, said the mob looted the accessories at his showroom, and damaged the infrastructure and building. “The windows of cars in the showroom were broken and then petrol was used to burn the vehicles. We are yet to get an idea of the exact damage. They also drove away with a few cars. It will take almost a year to rebuild the dealership,” he said. Jain used to sell around 100 cars a month. Jain, however, is not certain about continuing his business in Haryana. The events in Haryana will have an impact on sales volume of automobile companies in the region, directly and indirectly. “The law and order disturbance in Haryana has created major challenges for logistics of vehicles to North India. In addition, service and sales have come to a standstill as many dealerships are closed as a precautionary measure. "We are constrained to direct the logistic operators to stop the transportation of vehicles at the state borders and advise the dealerships to remain closed till things normalise,” said Rakesh Srivastava, senior vice-president (sales & marketing) at Hyundai. /p>Maruti Suzuki, which suspended production at its two Haryana plants on Saturday afternoon, did not resume operations on Monday. It has decided to keep operations suspended till 3 pm on Tuesday. It will take a call on further course during the day. Maruti and other companies in the Gurgaon-Manesar auto hub have been impacted by the Jat agitation, which has crippled the inbound and outbound supply chain at companies such as Maruti and Hero MotoCorp. The combined output from Manesar and Gurgaon plants is currently about 5,000 vehicles a day, implying a loss of 10,000 vehicles so far. The plants remained closed on Sunday. A Hero MotoCorp spokesperson said despatches from all the four plants - Gurgaon and Dharuhera (Haryana), Neemrana (Rajasthan) and Haridwar (Uttarakhand) have been affected due to the ongoing blockade of the national highways and other roads. Component makers, many of whom operate in the region, were also hit. “We are getting impacted like all the other companies, but there is nothing we can do about it. If an OEM (original equipment manufacturer) is facing production issue, its parts supplier is bound to see a resultant impact,” said Ramesh Suri, chairman of Subros, which manufactures AC kits for cars.